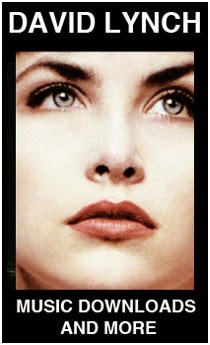 TWIN PEAKS ARCHIVE: TWIN PEAKS RETURNS TO TELEVISION IN ALL NEW EPISODES TO BE AIRED IN 2016/7 ON THE SHOWTIME NETWORK!!! TWIN PEAKS RETURNS TO TELEVISION IN ALL NEW EPISODES TO BE AIRED IN 2016/7 ON THE SHOWTIME NETWORK!!! HERE IS WHAT WE KNOW. TWIN PEAKS WILL RETURN TO TELEVISION IN ALL NEW EPISODES TO BE AIRED BY THE SHOWTIME NETWORK IN 2016/7. "One thing I can guarantee they will see — they will see a cup of coffee fly through a window." - Mark Frost on what fans can expect. 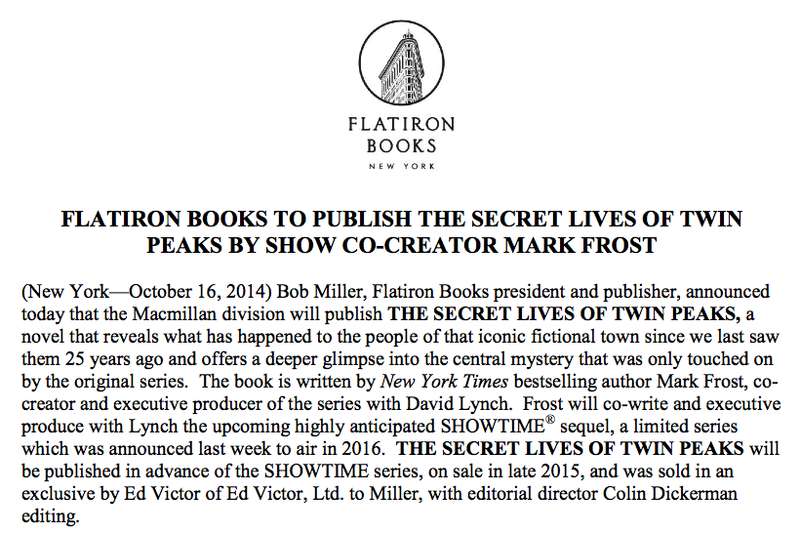 -'THE SECRET LIVES OF TWIN PEAKS IS DUE OCTOBER 8TH, 2015. -KYLE MACLACHLAN IS THE ONLY CONFIRMED ACTOR THUS FAR. -BUZZFEED INTERVIEW WITH MARK FROST. -ANOTHER BRAND NEW DEADLINE INTERVIEW WITH MORE DETAILS FROM MARK FROST! -BRAND NEW TVLINE INTERVIEW WITH MARK FROST WITH SOME DETAILS ABOUT THE NEW SERIES. -PRODUCTION DUE TO START IN 2015. -THERE WILL BE 9 INITIAL EPISODES. LYNCH WILL DIRECT ALL 9. -THERE WILL BE A MIX OF OLD AND NEW CHARACTERS. I'm incredibly excited. What a fantastic year for Twin Peaks fans! I've been following since almost the beginning of your blog which was pretty much the only thing about Twin Peaks online at that time. I have to say thank you to you and congrats because for the longest time Twin Peaks fans didn't have much to go to in the way of information. I think sites like yours have done a lot to get this little show back on the air. Twenty five years ago I would have never thought this would happen. Network tv killed off Twin Peaks. Even the movie didn't feel like it was a clean finish. I'm glad that at least in video viewing we have reached a point where now David Lynch feels good enough to bring the show back. It does feel good! Thanks everybody! We're going to have a long time to talk about and get excited about what's to come - looking forward to it! I'm so happy I could kiss Dale on his pointy little head! My contact has just informed me this project is going to get cancelled. Official announcement is due in the next few days. THE NEW SEASON OF TWIN PEAKS WILL DEBUT MAY 21ST ON THE SHOWTIME NETWORK. THERE WILL BE 18 HOURS. 'How to make coffee with Special Agent Dale Cooper' video by Tasting Table has just been released! The new Twin Peaks EPK is live! Huge interview with Chrysta Bell! Twin Peaks! New Album! The Fans! The Coffee! Mådchen Amick talks Twin Peaks in this new interview! 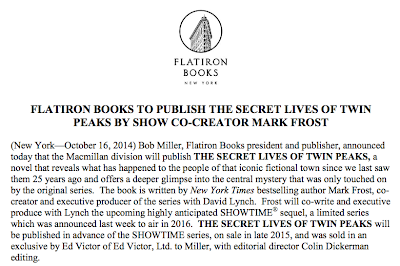 CONFIRMED: NEW TWIN PEAKS NOVEL BY MARK FROST 'TWIN PEAKS: THE FINAL DOSSIER' DROPS 10/31! The Blue Rose Magazine is a new Twin Peaks publication from John Thorne and Scott Ryan. Issue 2 is out now. Check out the website for print edition and more.